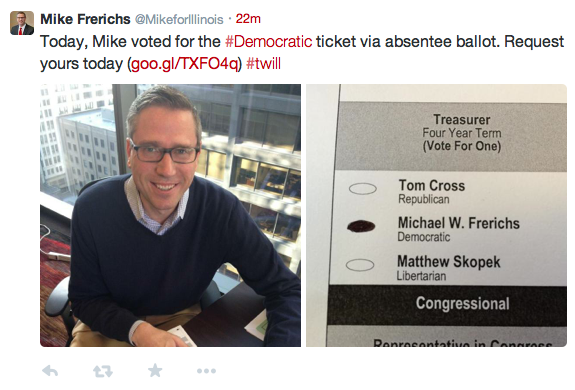 Mike Frerichs + Posting His Ballot On Twitter = Felony? As posted on Mike Frerichs' Twitter handle this afternoon: a selfie (of course!) of voting for himself. Illinois voters might want to reconsider that picture they posted online of their completed ballots. Turns out, it's considered a felony under state law. On Tuesday, people logging into their various social media sites saw photographs others posted of their completed ballots. The state's election code doesn't explicitly ban photographing ballots, but it does prohibit voting in a way that can be observed by others. Ken Menzel, deputy general counsel for the Illinois State Board of Elections, said posting photos of completed ballots on social media is a clear violation of that provision. ...Its classification as a felony — carrying a one- to three-year prison sentence and a maximum fine of $25,000 — reflects how seriously Illinois officials take the practice. Rut-roh. The Gaffeman strikes again! Reset the 'days since' counter, guys.